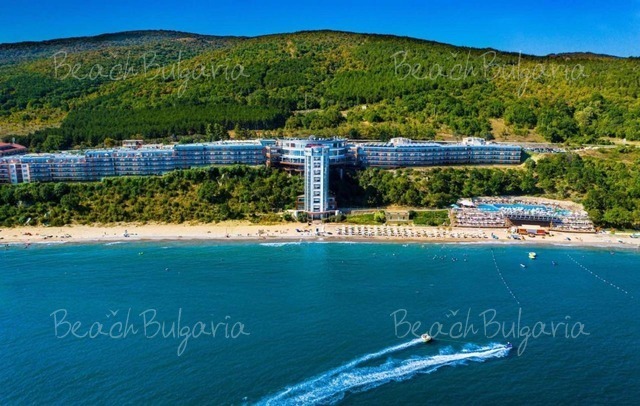 Sea Breeze Hotel is located on the boardwalk, which separates the hotel from the beach, in the central part of Sunny Beach resort. Numerous bars, restaurants, banks, a hospital and a police station are within a walking distance from the hotel. The hotel features 38 double rooms, 4 studios and 12 suites. The guestrooms offer mini-fridge, folding sofa, TV, telephone, balcony, sea or park view, air-conditioner. The restaurant with a sea view serves dishes from the Bulgarian and international cuisine. The property features an open air swimming pool for adults and children, 24 hours video security, safes, 2 elevators, reception desk, lobby bar, shops, change for currency, free of charge parking lot. * All prices are in EUR per room per night, breakfast and use of swimming pool, parasole, sunbed near the pool and internet included. * Maximum capacity: Double room - 3 adults or 2 adults + 1 child; Studio/Apartment: 3 adults + 1 child. * Cancellations can be made free of charge providing details of this are received at least 7 days prior to check-in time on the day of arrival and 14 days during 11 July - 26 August - cancellations made after this period will incur a fee equivalent to the cost of two night's accommodation. Please, post a comment on Sea Breeze Hotel.